Newer: » Introducing the Miss San Pedro 2012 contestants! The eight beautiful delegates for this year’s Reina de la Costa Maya Pageant have been in Belize for the past week travelling and enjoying some of what our country has to offer as they rehearse and gear up for the big night on August 2nd. Miss Esthefany Maolyth Pineda Perez of Honduras, Miss Karen Elena Jordan Beitia of Panama, Miss Mariela Aparicio from Costa Rica, Miss Ivey Jellisa Alvarez Hunter of Nicaragua, Miss Alessandra Manzur Franco of Guatemala, Miss Natalia Villanueva of Mexico, Miss Nathaly Jazmin Mena Arauz of El Salvador, and Belize’s very own Miss Karen Jasmine Middleton have all been taking in the scenery and enjoying activities in various locations throughout the country and right here on La Isla Bonita, San Pedro. 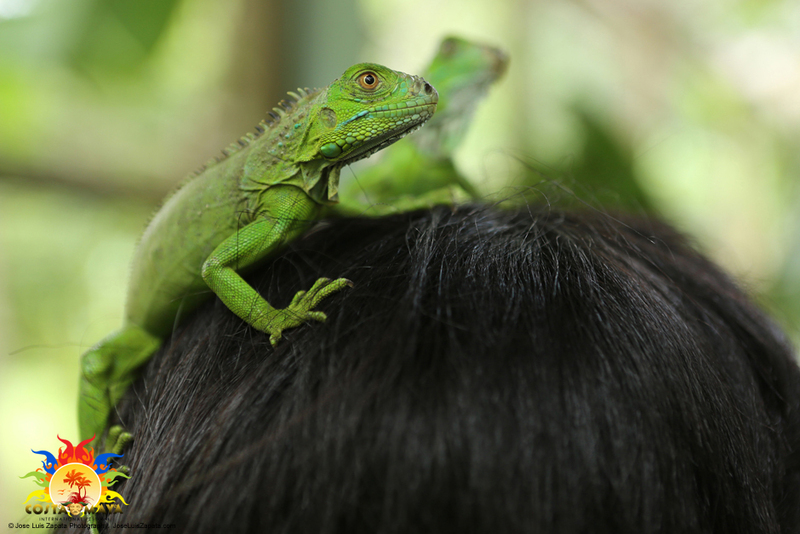 They’ve played with lizards at The San Ignacio Resorts’s Iguana Project, visited ancient Mayan Temples, walked along the bottom of the ocean in Ambergris Caye and dined at some of San Pedro’s best and most popular restaurants, while making new friends and new memories that are sure to last forever. After touching down in Belize on Thursday, July 26th, and being welcomed by representatives from the Belize Tourism Board (BTB) and pageant chaperones, the girls were swept off to Cayo to begin their weeklong journey leading up to pageant night. In Cayo they were hosted to a welcome dinner by the San Ignacio Resort and had the chance to meet with and model dresses from Belize’s budding and premier fashion designer Rebecca Stirm.They also spent a few hours frolicking with lizards at the San Ignacio Resort’s Iguana Project Initiative and as a special present from the resort, Miss Honduras Esthefany Perez, who celebrated her birthday here in Belize, had the opportunity to release one of the iguanas into the wild. Afterwards it was off the Cahal Pech Maya Ruins for the Official Reina de la Costa Maya Pageant photo shoot. From there the girls made their way over to Ambergris Caye where their island activities began when islands residents got their first glimpse of the contestants at a dinner and dance hosted by the world Famous Fido’s Restaurant and Bar. At Fido’s the girls enjoyed delicious food, were serenaded by the live band performing onstage and introduced themselves to everyone in San Pedro. Then the fun began… the ladies didn’t shy away from dancing and enjoying the fun atmosphere at Fido’s and even spent time mingling and chatting with the crowd as the night went on. The beauty and charm of the delegates surely made the night a great time to remember and of course, Miss Honduras celebrated her birthday properly with a surprise cake given to her from her fellow contestants and the Costa Maya Festival Committee. Following the night at Fido’s was “Noche Tropical” hosted by the Official Resort of the Reina de la Costa Maya, Ramon’s Village, where the delegates were officially introduced as contestants for the pageant. After official introductions each girl then received their sash from Miss San Pedro, Yakarelis Hernandez and Miss Top Celebrity 2012 Christine Syme, which marked the commencement of their journey to becoming La Reina de la Costa Maya. Guests then got the opportunity to admire the lovely contestant as they showcased traditional costumes from their homeland followed by a fashion show where they ladies graced the stage with outfits from MoonDancer Boutique and as a special treat and perhaps in appreciation for all the love and cheer she’d been getting since in Belize, the birthday girl, Miss Honduras displayed her talents as performed a danced to the rhythm of traditional Honduran Punta. Then on Sunday, July 29th, it was off to the waves and reef of the Caribbean where ‘las reinas’ were taken on a ride up north off the coast of Ambergris Caye on a full day Catamaran sailing adventure. Always a highlight for the contestants, the ladies boarded SEAduced by the Belize’s 30ft Catamaran and made their way up to Mexico Rocks and ventured down to the depths of the ocean, walking on the sea floor with Discovery Expeditions Sea Trek. After a delicious lunch at the impressive Mata Chica Resort’s award winning restaurant Mambo, it was time to head down to the Hol Chan Marine Reserve and swim with sharks and sting rays and the world famous Shark/Ray Alley. The beauties showed a little bit of brawn as they fearlessly and excited jumped into the water to swim with the sharks and had a wonderful time playing with the rays in the waters of Belize. When asked how she was enjoying here time on Isla Bonita, Miss Belize said that “I love it!” and surprisingly she also mentioned that “this is my first time out here and it is so beautiful.” Miss Nicaragua also commented that “the people here in Belize apparently really love pageants and treat us candidates as if we are already queens. What a true honor.” And an extremely enthusiastic Miss Nicaragua could barely contain her smiles as she said “Oh my God I love it! This place is so beautiful… I don’t even want to leave!” She couldn’t stop raving about how much fun she is having here in San Pedro as did all the girls here on the island have been saying… they all keep saying how they have been having a wonderful experience. Also over the weekend the girls took a little tour of San Pedro and had dinner at Caprice Bar and Grille as well as Hidden Treasures. During the week the ladies also took part in a fundraiser for the Saga Humane Society at Captain Morgan’s Resort and were hosted to a dinner by Mayor Danny Guerrero at Elvi’s Kitchen. Other stops included popular restaurant such as Wild Mango’s, El Fogon and Mickey’s Place all leading up to pageant night on August 2nd. The San Pedro Sun would like to say welcome to San Pedro and thank you to all the lovely young ladies who have come to our island to share a bit of their culture and beauty with us and we wish them all the best of luck on stage at the 2012 Reina de la Costa Maya Pageant. Official Photos for the Costa Maya Pageant provided by the Costa Maya Festival Committee and Official Photographer José Luis Zapata.